The science center in my classroom is always a busy place. Students can observe, experiment, create, construct, classify, compare, and question. Students are natural born scientists. They are curious and eager to explore the world and everything in it! As teachers, it is our job to nurture their scientific spirit and help students form questions, investigations, collect data, and share their conclusions. Make your science center amazing! Plus I have a few freebies for your center too! Just so you know, in my classroom, I combine my math and science centers together aka the Discovery Center. I believe math and science overlap in SO many areas it is natural for me to combine them together. Now let’s start setting up the center! First things first, labeling! Label everything you can in the center. 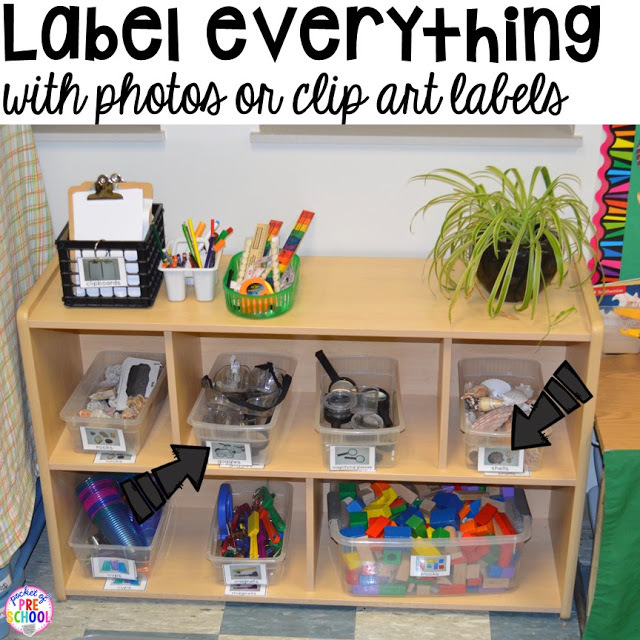 Labels show students (and teachers) where the items belong. It makes clean up easier and helps students be independent in your classroom. They won’t have to ask you for what they need. They will be able to find it themselves in the center. Don’t forget to have words paired with a picture on your labels! Grab my Classroom Labels HERE with real photographs! Tools! Every scientist needs tools. Two tools that are always in the center are magnifying glasses and goggles. All my other materials and tools are rotated throughout the year based on what we are investigating, our theme, and students’ interests. Sorting trays and tweezers give students a place to examine, count, organize, and classify (sort) items. And by adding tweezers you are sneaking in some fine motor work too! Put out balance scales, rulers, connecting cubes, and other measurement tools in the center for students to use when they are investigating and experimenting. Learn how to make your own bean and rainbow rulers HERE. Little scientists LOVE using pipettes and pie plates to explore and investigate. Yes, more fine motor work too! 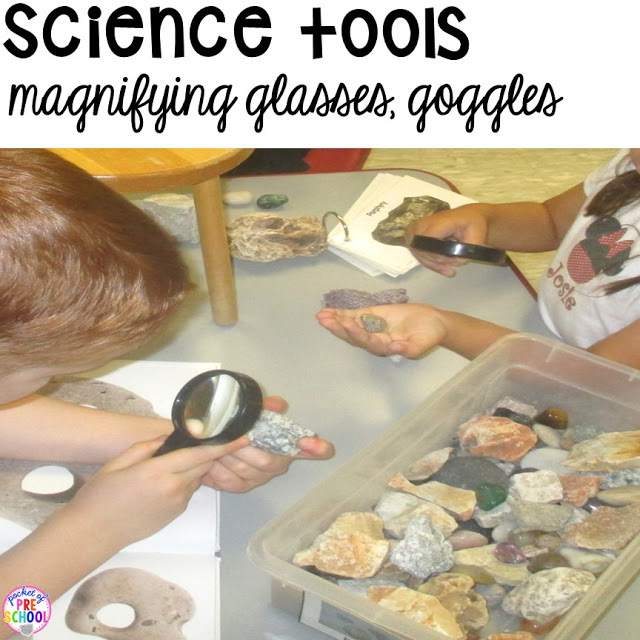 Other science tools you can add to your center are test tubes, mirrors, prisms, discovery bottles (sensory bottles), microscopes, and binoculars. Natural materials are easy to find and provide students with endless hours of investigating! Try adding shells, rocks, leaves, fruits, vegetables, seeds, feathers, sticks, pine cones, seedpods, flowers, and any other item you can find outside in nature to your science center. The Dollar Tree has shells, rocks, sometimes tree rings, and other seasonal nature items in their craft section. Remember to rotate the items based on the season or theme in your classroom. You want to have something living in your science center. It could be a plant or a class pet. Something students can take care of and observe over time. Add a book about the pet or plant to spark students’ interest in the plant or pet. STEM and STEAM are huge right now in education. An easy way to add a STEM activity into your science center is put a tub of wooden blocks on the shelf. I created these “I Can Build…” Cards to spark students engineering excitement! The cards challenge and inspire students to create something amazing. You can grab the STEM I Can Build cards from my TPT store HERE. 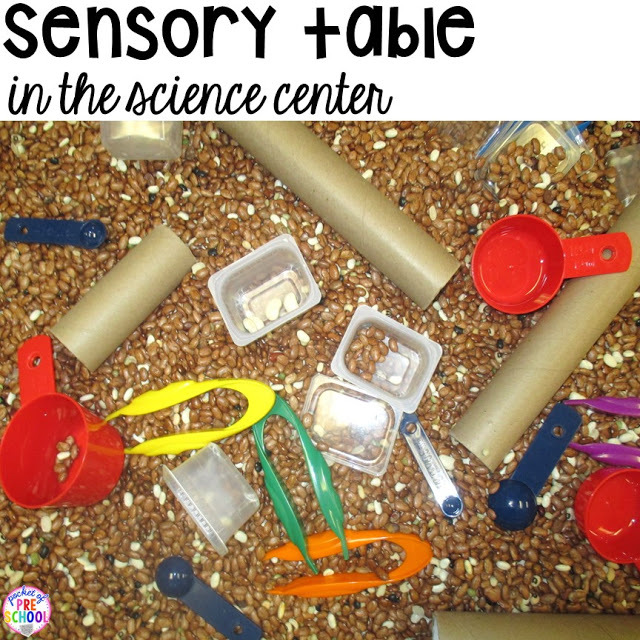 The sensory table and a light table can be a part of your science center too! I could talk for days about everything students can learn when they play in the sensory table. There are endless items and tools you can put in your sensory table for students to explore and investigate. Check out THIS SENSORY TABLE post for tons of ideas and a printable list for the sensory table. Magnets are a staple in an early childhood science center. For one thing ,students LOVE magnets! Students can explore, test their ideas, observe the results, ask new questions to investigate, notice patterns in their experiments, and draw conclusions with magnets. You can also add items to the tub that are NOT magnetic! 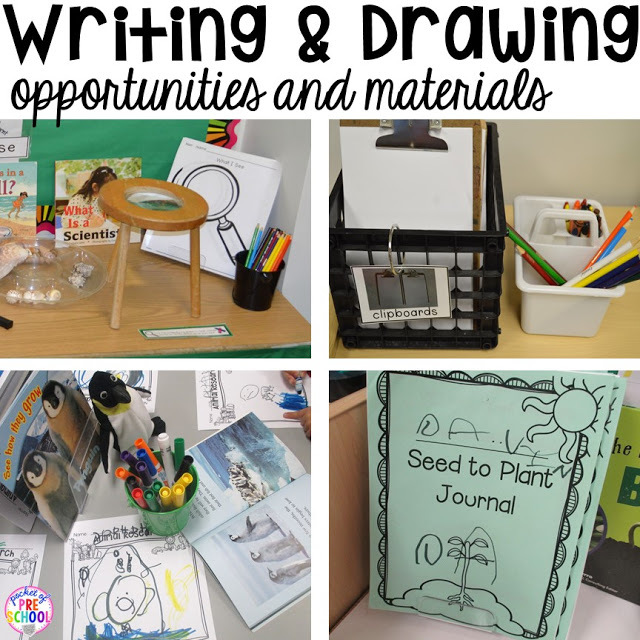 Just like any other center in your classroom, you want to have writing and drawing materials. Try putting out journals, discovery pages, and/or clipboards with blank paper in your center. Your little scientists will be drawing, charting, recording data, and writing about their discoveries in their preschool way! Grab your discovery page freebie at the bottom of this post. Books! When you add books to the science center it gives students another the opportunity to research and investigate a topic. These are some of my favorite science books. Dianna Hutts Aston books are just amazing! She wrote A Rock is Lively, A Butterfly is Patient, A Seed is Sleepy, A Beetle is Shy, and An Egg is Quiet. Try to pair a non-fiction book with a fiction book when you are investigating a topic. Hooray for Fish is one of my all time favorite children’s books! Andrea Beaty wrote an amazing series all about STEM! The books include Iggy Peck Architect, Rosie Revere Engineer, and Ada Twist Scientist. I have a science table in my classroom where I set up various scientific investigations based on our theme and student interest. Each investigation can last for a month or two week depending on our theme. When you are planning for your science center, remember to create investigations across all science areas (Life Science, Physical Science, and Earth Science). These are my student’s favorite science investigations from the past few years. This year my focus is to create the Science for Little Learners Curriculum to make it EASY for you to set up amazing science tables for your little learners. You can see the science units I have completed so far HERE. Color investigations are AMAZING! Put out red, blue, and yellow colored water and let the experimenting begin. 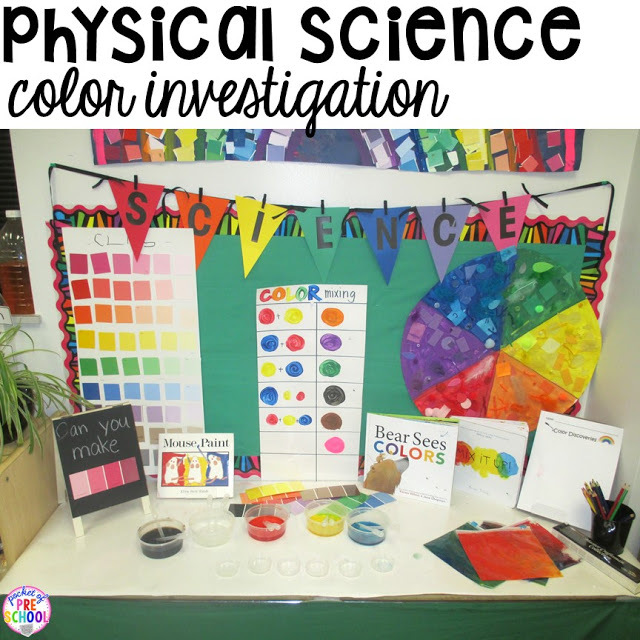 Grab some paint samples, create a color wheel, create a color chart using paint samples, color books, color investigation pages, and chart the colors students make to take the color investigation to the next level! Get a small chalkboard easel and pose questions for students to investigate (STEM)! Set up a building investigation for students to explore motion, balance, and force. Just add blocks, photos of tall buildings, blueprint paper, vocabulary cards, an anchor chart (Parts of a Building) and post a challenge. Grab the All ABout Buildings unit HERE. Some other fun physical science investigations are ramps/inclines, simple machines, how objects move (pushing, pulling), and magnets (those units will be coming soon to my TPT store). 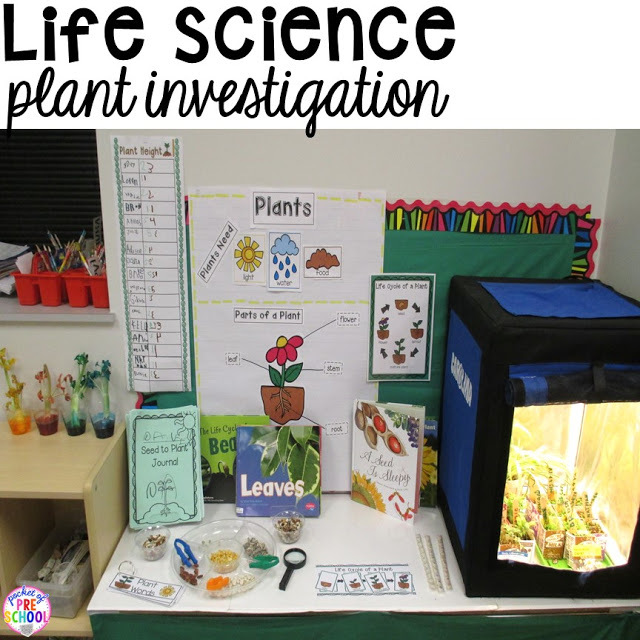 Life science plant investigation (grab the plant freebie here)! I think most of us have planted seeds and watched them grow. Add a sorting tray with seeds, plant books, journals, magnifying glass, tweezers, and chart the growth to your science table. Oh and that box thing is my greenhouse for our plants. I didn’t have ANY windows in my full day classroom so we used a light box. Butterflies, oh how we LOVE you! Let students help you create the anchor charts in your science center. Student created charts are POWERFUL! Grab my Life Cycle of a Butterfly HERE. A few other possible life science topics are worms, ladybugs, crickets, insects, spiders, hermit crab, ants, fruits, vegetables, flowers, and trees. Earth and Environmental Science! Almost every year the first science investigation on rocks. Rocks are like magical gems to students! It is a fun way to teach students how to be a scientist and how to use science tools. The second week of school I read, What is a Scientist? at circle and we create the “Parts of a Scientist” anchor chart you see in the picture (it’s a freebie at the end of this post). Other possible earth and environment topics are shells, sand, dirt, water, seeds, space, weather, sky, clouds, seasons, and recycling. You can also do themed science investigations based on what you are learning about. Most teachers I know and talk to set up the science tablet to match the learning theme and it’s what I do too! Students love learning about the ocean! Add some shells, sponges, shark teeth, ocean books, magnifying glass discover pages, rulers, magnifying glasses, sorting trays, and a scale! This picture was taken the first week of our investigation. I added shark teeth, sponges, and coral later to keep students interested all month long! Fall! There is so much to investigate: Pumpkins, Apples, and Leaves. My favorite thing to do is to cut open a pumpkin, plant the seeds, and watch them grow. Grab my All About Pumpkins science unit HERE. Set up a science table all about Apples in September when students are visiting the apple orchards or for back to school. Grab my All About Apples science unit HERE. Leaves, trees, and seasons are also fun to explore in the science center. Sort, measure, weigh and classify leaves and sticks. Grab the Leaves and Trees science unit HERE. I hope you a have a TON of ideas for the science center so go make it an AMAZING place for your little scientists! 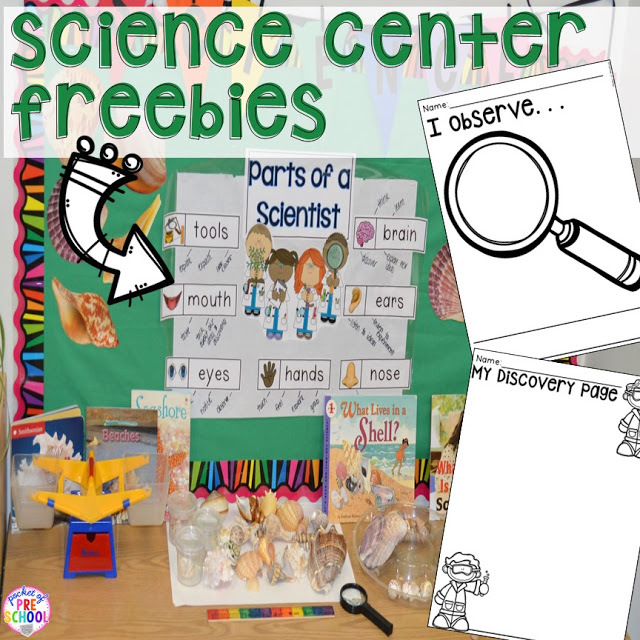 Go grab your science center freebies HERE or by clicking on the picture below. The Parts of a Scientist chart has been updated and now has REAL photographs! Want the Science Curriculum for Little Learners? It will make prepping the science center so much easier for you! It will come with 25 different units when it’s complete. Two units will be added each month until the curriculum is complete. 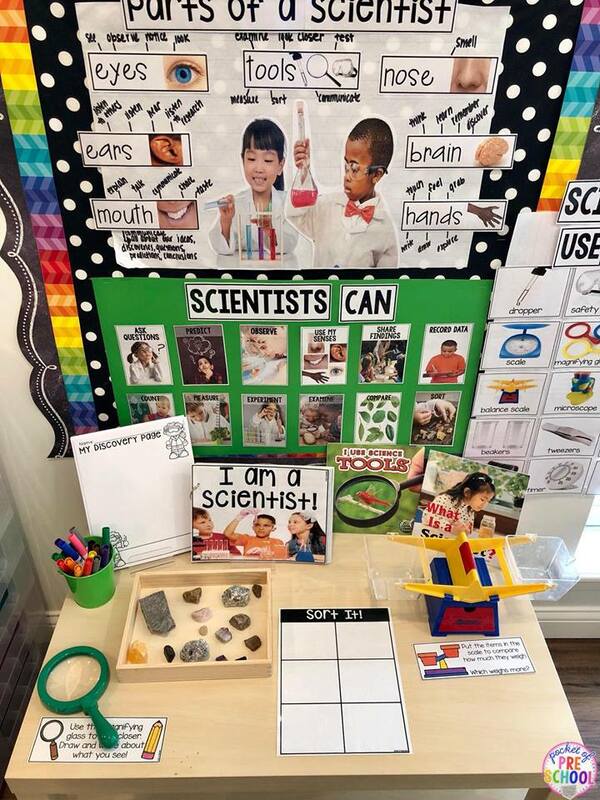 Each unit has TONS of real photographs, vocabulary cards, anchor charts, science table set up ideas (with real classroom photographs), science table activities, recording pages, family letter to send home, science journal pages, and more! Check it out HERE or by clicking the photo below! 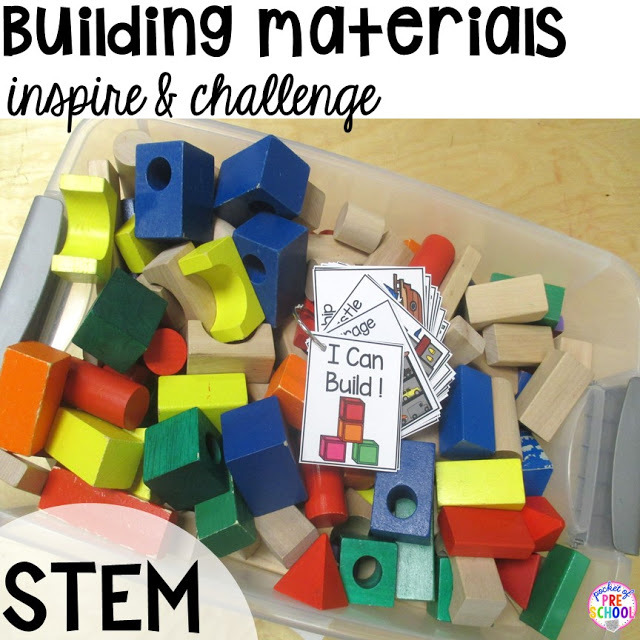 Add some STEM to your science center! Grab my I Can Build Chart and Books from my TPT store HERE. Love the ideas and want to remember it for later? Pin it!